In the British calendar the final Tuesday before Lent is known as “Shrove Tuesday”, though it’s more often referred to as “pancake day” in modern times. The derivation of the word “shrove” is unclear but it is thought to be derived from “shriving” or asking forgiveness for sins, a typical Christian activity on this day. As the final day before Lent, Shrove Tuesday is also traditionally a day of feasting before the Lentern abstinence or fasting that evokes Jesus’ 40 days and nights in the desert. The pancake bit comes from the fact that in order to find it easier to abstain, one should use up all ones flour, milk, sugar and eggs on Shrove Tuesday, and while a lot of things can be made from those basic ingredients, the Brits – long ago – decided pancakes were the thing to make. And, since the combination of these ingredients makes for a high calorie experience, Shrove Tuesday (it’s such a puritanical idea – shriving, isn’t it?) is known as Mardi Gras in French, or literally, fat Tuesday. Those Catholics have all the fun, don’t they? 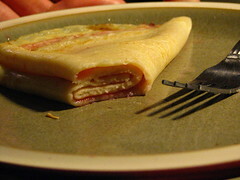 British pancakes have more in common with the a French-style crepe than they do with the thicker, but smaller pancakes common in America, although the recipe is largely the same. On pancake day it’s quite common to have a mixture of both savory and sweet pancakes, though the sweet versions are the more popular. 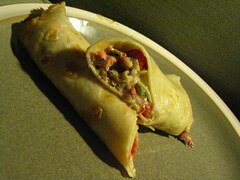 (We had both savory and sweet – see savory filling recipe below.) Typical fillings are very simple and are often limited to powdered sugar and jam or nutella, or just a squeeze of fresh fruit juice. My family’s favorite filling is granulated (plain, white) sugar and lemon juice. The less stuff you have in the middle, the more pancakes you can have, see…? Of course, you don’t have to wait another year before making some pancakes, though. They make great desserts, first courses, or even main meals depending on the filling and the size of your pan, and they are dead easy to make. So, go ahead, treat yourselves tonight, unless you’ve given up pancakes for Lent, that is. To make batter, combine flour, salt, melted butter and eggs together in a bowl. When well combined add milk slowly, whisking all the time. Continue whisking until mixture is smooth and frothy. Batter is ready. Cover and set aside. Now it’s time to make the savor filling. Melt butter in small saute pan over medium heat. Add shallots, garlic, leeks and mushrooms and sprinkle with salt and pepper. Saute mixture for 3-4 mins or until mushrooms take on some color and the leeks wilt nicely. Add cream and tarragon and reduce heat to low. Cook for another couple of minutes. Adjust seasoning. Allow to keep warm on low until pancakes are ready to be filled. In another pan saute or grill your asparagus, or just put them in a bowl with a little bit of water, cover with plastic and microwave for 2 to 3 minutes. Slice your smoked salmon. Heat a 12inch non-stick skillet over medium high until the pan is too hot to touch. Toss in a knob of butter and allow to melt almost completely before adding a ladle-full of batter to the pan. Tilt pan in a circular motion so that batter covers bottom of pan. 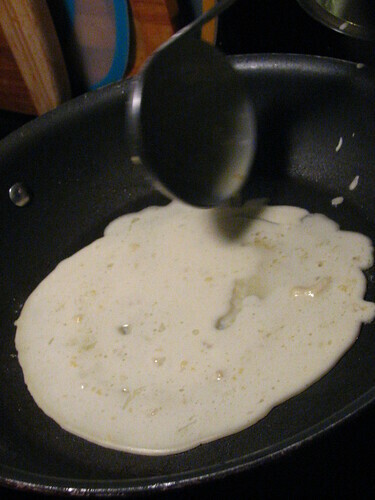 Allow pancake to “solidify” (cook) until almost all of the moisture has gone before tossing it, about 30 seconds – 45 seconds depending on how hot your pan is. The toss is the tricky bit and there have been many times when my kitchen ceiling has been festooned with bits of partially-cooked batter on Shrove Tuesday, so be careful with it. 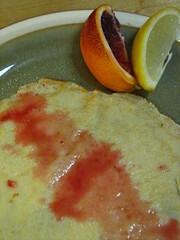 In fact, the lower the toss, the easier it is to do it right and have the pancake land without folding over on itself. Alternatively, you could use a non-stick, plastic spatula and give it a quick flip. It’s much easier and safer, though less fun. Put pancakes on a plate and separate with parchment paper, and keep in a warm oven until you’re ready to eat. Spoon in a bit of the creamy tarragon mushroom mixture into the center of your pancake. Add some smoked salmon and asparagus, roll, up and dig in! After you’ve completed eating your savory crepes, go back to your heated pan and make a few more. When done, sprinkle your crepe with 1/2 a teaspoon (or more if you’d like!) of sugar all over. Squeeze some orange down the center and then some lemon. Roll up or fold into a triangle and enjoy. Strangely, I’m not sure I ever had a British pancake. We’re always making American ones! Thanks for sharing such wonderful variations. I just read about this tradition, and I want to incorporate this into my pre-Lent traditions next year! I love exploring new food traditions, thanks for the informative post!